Back in June, Sony and Verizon Wireless proudly announced the Xperia Z4v, saying that they'd launch it in the US sometime "this summer." But the handset hasn't been released yet, and there's no word on when this is going to happen. Still, someone somehow managed to get an Xperia Z4v and use it for almost a week - enough to make a lengthy video and post it on YouTube. According to the guy who posted the video, the Z4v is not "up there" with other flagships of 2015, though it's still a "solid phone." He mentions that the Snapdragon 810 processor that's powering the Z4v makes the device overheat at times, but this doesn't seem to be a major problem. The 20.7 MP rear camera of the Z4v seems to be pretty good, and the same is said about the 5 MP front-facing camera. Of course, the Z4v that's showing up in the video might be a pre-release version, so let's wait for the phone to hit the shelves before jumping to conclusions. As you may know, the Xperia Z4v is Sony's first Quad HD (1440 x 2560 pixels) smartphone, though, in the meantime, the company also announced the Xperia Z5 Premium. Speaking of it, the Z5 Premium, alongside the Xperia Z5 and Xperia Z5 Compact, will be launched in the coming months - perhaps not in the US, but still, with the arrival of the Z5 series, the Z4v has lost a lot of its charm. Update: Unfortunately, the Xperia Z4v preview video was made private, so we can't watch it anymore. 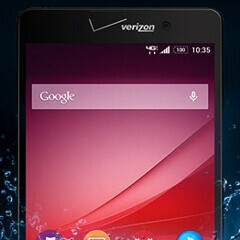 Hopefully, the handset will be soon released by Verizon. Meanwhile, check out our own Xperia Z4v hands-on. There goes Verizon once again placing tramp stamps all over their phones. back and front! time to cover it with a case! This is the main reason Sony fails, the predecessor has not reached people's hand, and successor already announced.